FLast refresh, February 6, 2015. Some useful statistics. Universities, Independed researchers of Ancient History, Philology and Philosophy, researchers of Philosophy, Ancient history, Atlantis and Authors are many of our visitors and are welcomed. Many others visits are undesirable search machines, robots, e.t.c. See the last month statistics. Most visits from USA. New Zealand (Aotearoa), Netherlands,Norway, Network (net), Non-Profit Organization. Singapore, Switzerland, Seychelles, South Africa, Sweden, Slovakia. October was the most active month so far, within 2013. Very good results when someone considers the subjects of the site. November 2013 -24 visits per day (Avrg). Total visits 756. December 2013 – 27 visits per day. Total visits 856. January 2014 – 24 visits per day. Total visits 762. February 2014 – 26 visits per day. Total visits 748. New record of visits in March 2014. March 2014.- Avrg 27 visits per day. Total visits 836. Visitors’ Countries in March. Ref. per visits. Greece – Ukraine – Russian Federation – European Union – China – Japan – Czech Republic – Generic Business – Non-Profit (org) – Finland – Poland – Seychelles – Educational (edu) – Croatia – Hungary – Brazil – Canada – Denmark – Italy – Turkey. May 3, 2014 – Average (so far) 21 per day. Maximum 34. Total visits 74. Brazil has the most hits during the first days of May! of visits from most of countries during August. Slovakia – Lithuania – Seychelles. 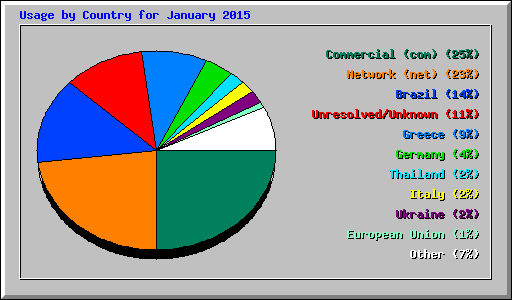 JANUARY 2015 – Total visits 1.650 (new record). Visits per day:95 – kB 73727 per day! of visits from most of countries during January. Colombia, Finland, Hungary, Turkey, Guyana, India, Slovakia, Canada, China.